The sculpture has been on loan by the artist for the last two years but we now need to buy it or it will be removed. We are organising a Crowdfunder campaign but we need to find some match funding. It is large and made of bronze so it was expensive to produce and although it is being offered at half the commercial price we still need to raise 25k in total. 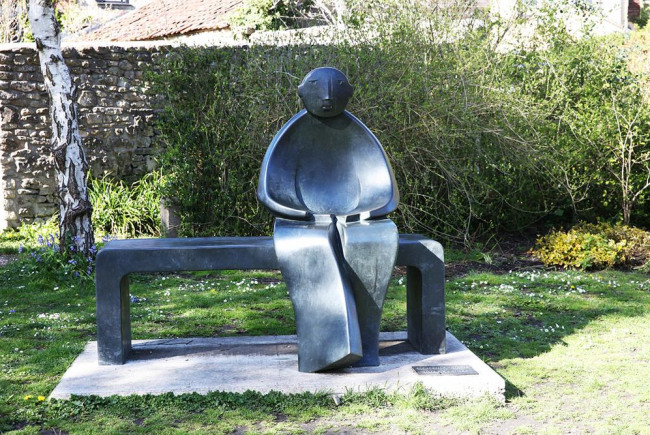 The sculpture (called Man on Bench) is very tactile and friendly. Overtime you pass the space on a sunny day you find children sitting on him, parents on the bench, toddlers in his lap.....children playing around the sculpture. He creates a landmark which enhances the cultural life of those in the town; art that is accessible to all. The fundraiser will be run by Bruton Community Partnership. Bruton Community Partnership brings together individuals, elected representatives and local organisations to work towards improving the quality of life in Bruton, complementing and enhancing what is being done by the Town or District Councils. If the campaign is successful the sculpture will then be donated to the town. Project Delivery Manager: Bruton Town Council The Project Delivery Manager takes legal responsibility for receiving and spending the funds raised and ensuring the project is delivered.